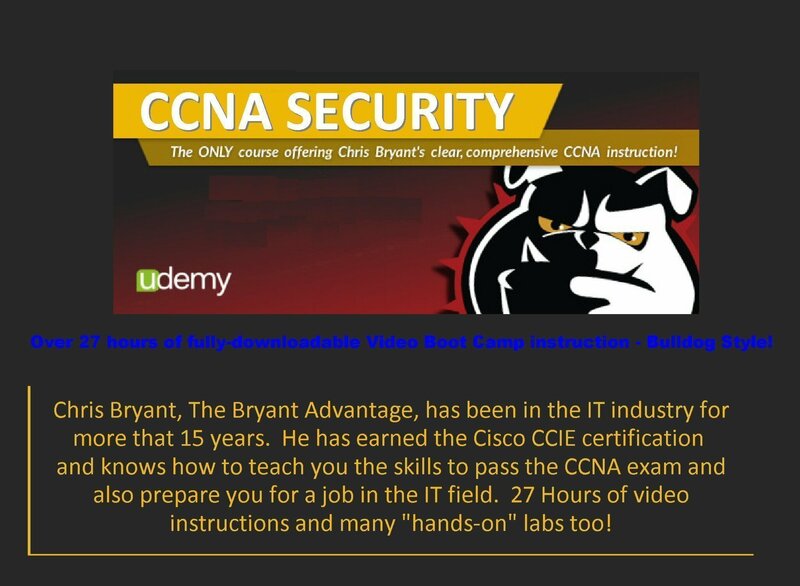 The Bryant Advantage’s CCNA Security 210-260 online video course with hands-on labs. 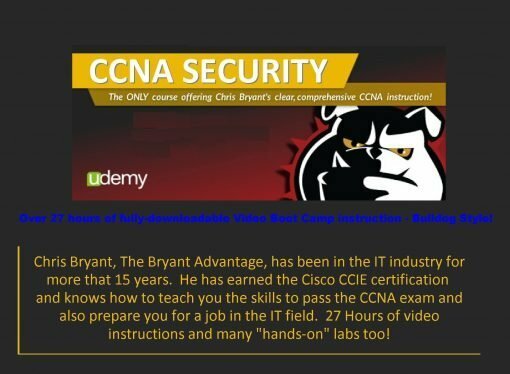 The Bryant Advantage’s CCNA Routing & Switching (200-120) online video course with hands-on labs. SKU: LAB-NA-SP-v2. Category: CCNA Security Lab Kits. CCIE Chris Bryant has redone his 210-260 CCNA Security exam course to better meet the exam requirements and is including his CCNA Routing & Switching course for free with the purchase of this CCNA Security Standard Lab Kit. Now you can use one lab kit and get two certifications for the same price. (Cisco exam costs are extra). Presenting our New Top-of-the-Line CCNA Security Ultimate Lab Kit. This lab kit has everything you need to learn and pass the CCNA Security 210-260 test and well into the CCNP Security course. The 210-260 test covers topics including knowledge of secure network infrastructure, understanding core security concepts, managing secure access, VPN encryption, firewalls, intrusion prevention, web and email content security, and endpoint security. This exam validates skills for installation, troubleshooting, and monitoring of a secure network to maintain integrity, confidentiality, and availability of data and devices. With average salaries ranging from $45,000 to $95,000 it just might be. And with the CCNA Security certification you’ll be ready for specialized jobs such as network security specialist, security administrator, and security support engineer. Through the CCNA Security training, you will gain an overview of security challenges and solutions, and be able to install, monitor, and troubleshoot Cisco security solutions to secure a small branch office network. Cisco IOS security features on Cisco routers and switches are deployed using both graphical user interface tools (GUIs such as the Cisco Security Device Manager or SDM) and command line interfaces (CLIs). You will also understand the necessity of a comprehensive security policy and how it affects the posture of the network. Your potential salary is another important factor. Industry surveys show that IT specialists receive higher compensation. Once certification is achieved, CCNA Security certification holders can make anywhere from $45,000 to $95,000. Salaries will vary based on experience, location and position, but the average income for CCNA Security personnel is $82,000. All of the CCNA concentrations help you to distinguish yourself in the highly competitive world of IT networking. CCNA Security takes full advantage of your current CCNA certification as a foundation, while specifically preparing you for new career opportunities in network security. Your CCNA Security Ultimate Lab Kit comes complete with everything you need to study for your CCNA Security career. Starting with a Cisco Adaptive Security Appliance ASA-5510 firewall with the Security Plus license that integrates multiple full-featured, high-performance security services, including firewall failover, 25 Vlans, application-aware firewall, SSL and IPsec VPN, IPS with Global Correlation and guaranteed coverage, antivirus, antispam, antiphishing, and web filtering services. A Cisco 1941 second generation router that has the optional Security license included. It runs IOS version 15.7 and has 512MB DRAM, 256MB Flash RAM, 2 EHWIC/HWIC/WIC/VWIC/VIC slots, two Gigabit Ethernet ports, USB, console and AUX ports. There are two 2811 routers running version 15.1 IOS with 2 Fast Ethernet ports, USB, console and AUX ports, 4 HWIC/VWIC/WIC,VIC slots, 1 NM/NME Network Module slot, and 256 megabytes DRAM with 128 megabytes of flash RAM. You also receive a Cisco 3750v2, IOS 15.0, Layer 3 Fast Ethernet stackable switch with Open Shortest path First (OSPF) routing support, advanced quality of service (QoS), rate limiting, access control lists (ACLs), and basic static and Routing Information Protocol (RIP) and OSPF routing functions, advanced hardware-based IP unicast and IP multicast routing as well as policy-based routing (PBR), IPv6 routing and IPv6 ACL support. Lots of accessories are also included. You get two HWIC-1DSU-T1 serial cards, four WIC-1DSU-T1-v2 serial cards, and four WIC-1T serial cards. This allows you to gain knowledge on both types of serial interfaces. Plus plenty of cables to wire up all those ports in your labs. The CCNA Security Ultimate Lab Kit includes all the hardware listed and the full CCNA Security 210-260 online video course presented by CCIE Chris Bryant. This course has lots of “real-world and hands-on” labs for you to learn from. Your copy is fully licensed by TBA and comes with their email support in addition to the free support we provide. Section: 35 – Your CCNA Security 210-260 Course Starts Here! The CCNA Security course explained by Chris Bryant. Your copy is included in your kit at no additional cost to you! 1941 Router; 100-240VAC auto-switching 1A average..
ASA 5510 Firewall; 100-240VAC auto-switching 2.5A average.